Maldives' President Abdulla Yameen, left, shakes hands with China's President Xi Jinping after a signing ceremony at the Great Hall of the People in Beijing (Dec. 7, 2017). With a new FTA, China cements its influence in Maldives, much to India’s dismay. India’s influence in its neighborhood was dealt a stunning blow recently with Maldives entering into a Free Trade Agreement (FTA) with China. The FTA, which was signed on December 8, 2017 during Maldivian President Abdulla Yameen’s four-day visit to Beijing, is Maldives’ first with any country. Maldives has become the second South Asian country after Pakistan to sign an FTA with China. In addition to the FTA, Maldives signed a Memorandum of Understanding that brings it into the Maritime Silk Road, a component of China’s ambitious Belt and Road Initiative (BRI). Other pacts that were signed during Yameen’s trip will deepen bilateral cooperation in an array of fields, including health, tourism, technology, and climate change. An archipelago of around 1,200 islands in the Indian Ocean, Maldives’ strategic significance stems from its proximity to international sea lanes through which two-thirds of the world’s oil and half its container shipments pass. Maldives is also located just 700 km from India’s Lakshadweep island chain and around 1,200 km from the Indian mainland. Relations between India and Maldives go back several centuries. This relationship grew in the decades following Maldives’ independence from British colonial rule in 1965 and strengthened in the 1980s and 1990s. India played a critical role in building Maldives’ economy and ensuring political stability there. It supported the authoritarian rule of Maumoon Abdul Gayoom, a half-brother of the current president, and enabled him to remain in power for three decades. It even dispatched troops to Maldives to avert a coup attempt to oust Gayoom in 1988. India’s influence over Maldives began fraying after former President Mohamed Nasheed, who was perceived as India-friendly, was forced to resign in February 2012. An agreement signed by India’s GMR Infrastructure under Nasheed’s tenure for upgrading Male airport was abruptly terminated by his successor in November 2012. The contract was subsequently awarded to a state-owned Chinese company. Until 2011, Maldives was not a priority in China’s foreign policy; Beijing did not even have an embassy in Male. However, Sino-Maldivian relations have grown remarkably since Chinese President Xi Jinping visited the archipelago in September 2014. China’s presence, especially in Maldives’ tourism sector and infrastructure building, has expanded. It has replaced Europe as Maldives’ largest source of tourists. China is funding and building mega infrastructure projects, including the Friendship Bridge linking Male to Hulhule Island and a 1,000-apartment housing project on Hulhumale, a suburb built on reclaimed land. The FTA and BRI will increase the Chinese role in the Maldivian economy. Under the FTA, China and Maldives “would reduce the tariffs of over 95 percent of the goods to zero. They are also committed to opening the service market such as finance, healthcare and tourism and agreed to cooperate practically in key areas,” China said in a statement. According to Maldives’ Ministry for Economic Development, although the country will lose $4 million in import duty revenue in 2018 because of a tariff waiver on Chinese goods, it will earn higher revenue from the goods and services tax due to “trade creation” and “trade expansion” once the FTA comes into force. The FTA is also expected to boost Maldives’ fishing industry. Indeed it was to open up new markets to Maldivian fish traders that Maldives decided to pursue an FTA with China, its government said. In 2011, when Maldives transitioned from Least Developed Country to Middle Income Country status, it became ineligible for tariff reductions from its largest trade partner, the European Union (EU). Consequently, Maldivian fish exporters have had to pay a 25 percent duty to enter the EU market. The FTA with China presents Maldivian fish exporters with new opportunities. It will open up the “world’s largest consumer market” to Maldivian fish and fish products at zero duty, Maldives’ Minister of Economic Development Mohamed Saeed has said. The FTA will also open up the archipelago’s tourism sector to Chinese investors and allow them to operate hotels, restaurants, yacht marinas, as well as travel agencies and transport services. Maldives is hoping to step up tourist arrivals from the current 1.5 million per year to 7-8 million per annum and will have to build more resorts and other infrastructure to meet the surge in demand. It will require equipment and expertise on a large scale, Maldivian Minister of Fisheries and Agriculture Mohamed Shainee has pointed out. The FTA will ease Maldives import of such equipment from China. However, the FTA with China and the manner in which Yameen rushed it through parliament has come in for sharp criticism in Maldives. “Despite requests, the [opposition] MPs were not given access to the document in order to review it before passing. The government allowed for less than an hour for the entire parliamentary process to approve the 1,000-plus page document,” the opposition Maldivian Democratic Party (MDP) said in a press release. The FTA’s opponents are also warning of a looming Chinese debt trap. 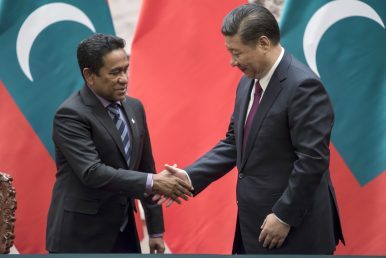 Already over 70 percent of Maldives’ current foreign debt is owed to China, on which the loan interest alone “is more than 20 percent of Maldives’ budget,” Nasheed told Times of India. The FTA can be expected to draw Maldives deeper into Chinese debt, giving Beijing “huge leverage” over Maldives, undermining the country’s sovereignty and independence, he warned. This has been the experience of Sri Lanka, for instance. China extended loans totaling billions of dollars for infrastructure projects in Sri Lanka. With some of these projects, such as the strategically located Hambantota port and an airport nearby, not attracting enough business and unable to repay the roughly $8 billion owed China, the cash-strapped Sri Lankan government agreed to hand over Hambantota port to China on a 99-year lease as a way of paying down some of that debt. A similar story is unfolding in Pakistan, where the China-Pakistan Economic Corridor (CPEC), a flagship venture of BRI, will leave Islamabad with an estimated debt of $90 billion that it will have to repay China over the next 30 years. Pakistan has already handed over the operation of Gwadar port to China for a period of 40 years. Under the agreement, the state-run China Overseas Port Holding Company will take 91 percent of revenue collected from terminal and marine operations and 85 percent of gross operations revenue from the Gwadar free zone. In effect, Pakistan has lost control of the port for the next four decades. How many other Chinese-funded projects will Pakistan cede to China to pay back its debts? India’s security analysts warn that Maldives too can be expected to slip into a Chinese debt trap, leaving it vulnerable to Beijing’s demands and pressure. New Delhi is apprehensive that such pressure will culminate in China acquiring a naval presence in Maldives. Such fears deepened in 2015, when the Maldivian parliament enacted a law that allows foreigners to own land in Maldives provided they invest over $1 billion in a project and 70 percent of the project site is on reclaimed land. Although this law is not China-specific and is applicable to all foreigners, China is expected to be the main beneficiary as it has the financial capacity to make large investments. This law could ease the way for China to buy Maldivian land to set up a base, if not a listening post on a Maldivian island. In August 2017, Maldives permitted three Chinese warships to dock in Male. In a bid to allay India’s concerns, Maldives dispatched Foreign Minister Mohamed Asim to New Delhi. In his interaction with Indian Prime Minister Narendra Modi and Minister of External Affairs Sushma Swaraj, Asim is said to have “reaffirmed his government’s India First policy and emphasized that Maldives attached the highest priority to its ties with India,” a statement issued by the MEA said. If not in its actions, at least in its words Maldives is attempting a careful balancing act between India and China.